Majlis-e-Aza Shahadat Hazrat Fatima Zahra (s.
Imam Ali center have weakly reciting cessions. In these meetings, we recite Quran in group with help of a professional qari. In addition, we read the translation in Farsi and Mr. Islami (in Farsi) will interpret the part that have been red. These sessions are open to public. The Oslo Imam Ali (a.s.) offers high quality Persian language courses for children and youth. We invite all parents to use this golden opportunity to familiarize their children’s with Persian literature and culture. The cornerstone of Islam is “Tawhid”, i.e. Monotheism. “Tawhid” means belief in only one God and that existence in general– among other things the order of nature–is a manifestation of His grand design, as well as turning to God in prayer and glorification, away from worshipping any other. Not only my tongue but also my heart and inner light all proclaim that there is no other than the Creator of the world who is worthy of adoration. This means: Say and act sincerely, and believe with all your heart that apart from the only Creator of the world there is nothing worthy of adoration and this shall be your path to salvation. Islam has attached importance, more than anything else, to the proper knowledge of God, free from any aberration. It is chiefly here that Islam is outstanding. Consequently, in the course of my talk will have to be a basis for your future acquaintance with Islam, I shall attend to this feature. The only God to whom Islam invites everyone is inaccessible to the senses. He is beyond the reach of eyesight nor is He open to touch. Vision does not penetrate beyond colour and figure but God has neither one nor the other . His glory is beyond the reach of vision and other senses in general. We generally have a mental picture of things we know, for example: flowers and fruits, hills and dales, sun , moon and stars and human being as well. But what about God? Can we also form an image of Him? Because our notions are a result of our experiences, or constructions out of our experiences or of analysis carried on by our restless mind, yet having their roots in things we have come to know through our senses. “The Creator of the heavens and of the earth. He has created pairs of yourselves as well as pairs of the animals-thereby He multiplies you. Yes , God can be represented neither in form of a painting nor a statue. He can also not be conceived. Among these erroneous ideas is the notion that God has children. There are people who believe that Jesus-peace be with him- is the son of God. There have also been people and perhaps there still are, who fancy that angels are God’s daughters. “… And they falsely, having no knowledge, attributed to Him sons and daughters. Praise and glory to Him! He is far above whatever they attributed to Him. The Creator of the heavens and the earth, wherefrom could He have a child, when He has no consort? “And they say: ‘Allah begot a son. The Koran warns us against considering angels and apostles as God’s offspring. They are His bondsmen, though admittedly eminent among them. But by no means may they be considered as His children. Adam, Noah, Abraham, Lot, Hud, Saleh, Ismael, Isaac, Jacob, Shoaib, Moses Joshua, Enoch, John, Jesus, Mohammad, and the other apostles are like us in so far as they are men and God’s servants. He has created them as He has created others. Should those who say that Jesus is God’s son mean that God is a father as we are to our children, then their characterisation of Him is improper. 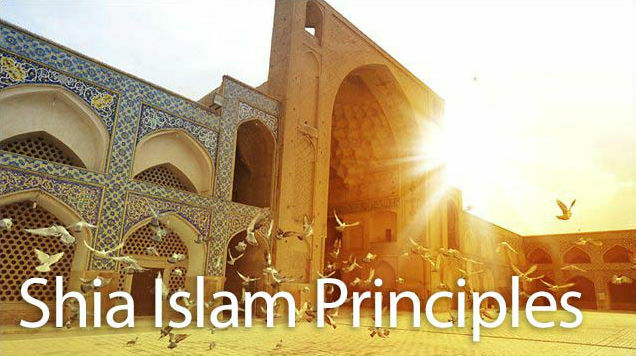 Basic Introduction to Shia Islam -Part 1-What is Islam?